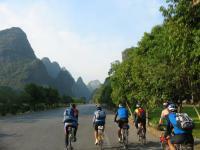 Yangshuo, 65 km southeast Guilin, is a county (population 300,000) directly under its jurisdiction. 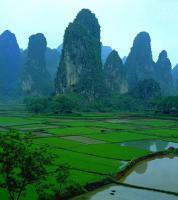 Set amid limestone pinnacles, Yangshuo is a small town over 1,000 years old, built during the Sui Dynasty (590 A .D.). 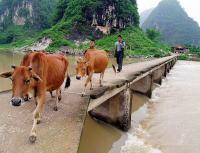 It is famous for its spectacular scenery of hills and rivers. 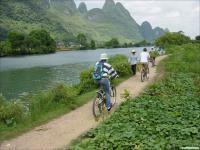 The Lijiang and Yulong rivers run by the town. 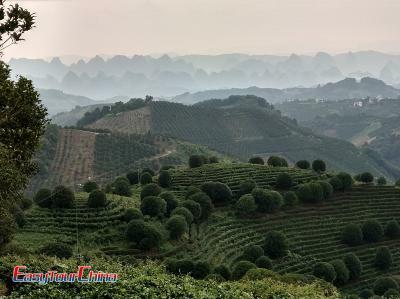 The scenery along both rivers is superb, and a traveler of the Ming Dynasty Xu Xiake (1586-1641) described it as 'the land of green lotus and jade-color bamboo shoots'. 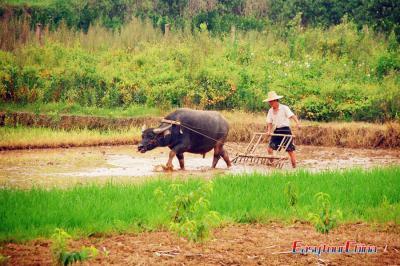 It is a great laidback base for which to explore other small villages in the nearby countryside. 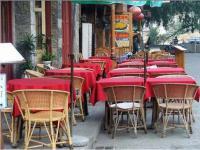 Along a slab-floored street in the town see many western-style cafes, comfortable and popular among tourists. Native produce is abundant due to the fertile land and includes fruits such as oranges, tangerines, pomelos, chestnuts, and kumquats. 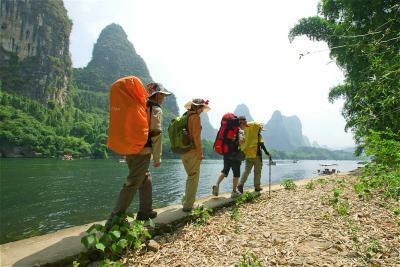 Famous scenic spots in Yangshuo are numerous such as Moon Hill, Shutong Hill, Yangshuo Park, Fuli and Xingping Town. 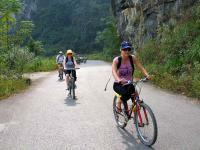 Outdoor activities like rock climbing, biking, hiking, bamboo rafting and hot ballooning are popular here. 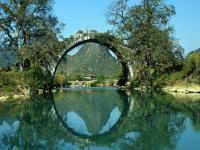 The 1,300-odd-year-old Banyan Tree is located only 7 kilometers south of the Yangshuo County. Its branches spread out in all directions, and its roots twisting crisscross, and the tree takes six men to encircle its trunk with their arms stretched out. Under the tree there is an aged ferry, called 'Aged Ferry under the Shade of the Aged Banyan'. On the opposite bank of the river stands a hill with a cave going through it, therefore the hill came by the name 'Pierced-through Hill'. A hook-shaped rock, called the 'golden hook', protruded from near the hilltop, and another rock is found at the foot of the hill, which resembles a living frog ready to jump into the stream at any time. About one kilometer from the Banyan Tree lies a hill whose peaks tower the sky as if it has reached the clouds. 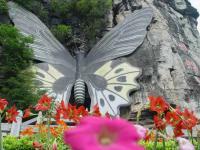 The hill has a cave with a diameter of 11 meters looking just like a full moon, hence the name. 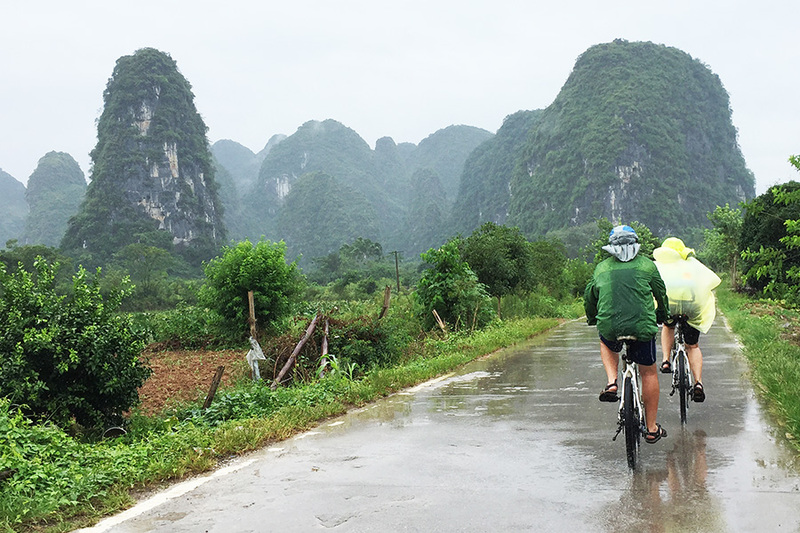 Viewed from different angles, the cave takes different shapes, just as the moon changes shape with the elapse of time; this is one of the major charms of Yangshuo. 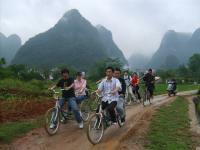 Fuli is a very small town of Yangshuo, with a mere 1,000-strong population. Nearly a third of its people work with traditional Chinese art and crafts, making painted folding fans, framing calligraphy of painting. 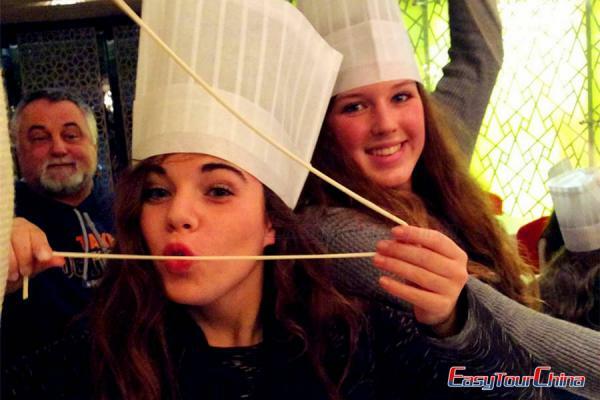 Most of them get rich by selling these handicrafts to tourists. Former US President Bill Clinton called their fans 'natural air-conditioners' when he visited Yangshuo in 1998, bringing unexpected fame as well as cash to the town.